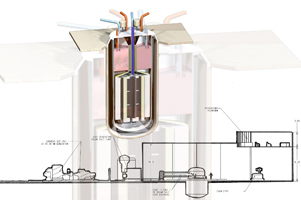 So far, the Integral Molten Salt Reactor (IMSR) has not drawn as much attention as LFTR has. However, IMSR might well prove to be the development with the best prospects of turning into a reality. The IMSR is a further development of the research of ORNL as late as the 1980s on DMSR, the Denatured Molten Salt Reactor. The ‘Denatured’ part of the name comes from the use of ‘denatured’ uranium, simply put this means a high content of 238U. According to IMSR’s main proponent and developer, the Canadian researcher David LeBLanc, the original DMSR was developed ‘to offer the perhaps the highest and most transparent level of resistance’ against possible use of the nuclear content in weapons. (The quote is from an article of David LeBlanc ‘Molten salt reactors: a new beginning for an old idea’, published in Nuclear Engineering and Design 240/2010). Where the LFTR’s designers chose the way of optimizing through continuous processing of fission products, IMSR chooses simplicity. In itself, LeBlanc explains, fission product processing is ‘technically not overly challenging’. But fuel processing does imply significant research costs. Especially to prove its safety in relation to proliferation resistance. For this reason, ORNL performed extensive studies on Single Fluid designs, that would allow for a reactor to operate without any fuel processing – apart from removal of gaseous fission products and noble metals – for an entire 30 year plant lifetime. All fission products that form stable fluorides simply remain within the reactor. IMSR, says LeBlanc, is directly based on the DMSR concept and we can be pretty sure it will be a single fluid reactor in ORNL’s terminology. Meaning: there’s no outer blanket of molten salt containing the fertile thorium. LeBlanc strictly follows the KISS-rule (keep it simple stupid). That’s why the IMSR needs to be a ‘burner’ not a ‘breeder’. Dictated by the same rule, IMSR will employ thermal spectrum neutrons, rather than fast neutrons. An important difference with Oak Ridge’s DMSR is, again according to LeBlanc, a surprisingly simple solution for the ‘plumbing problem’ of the DMSR. Unfortunately, LeBlanc does not give away any details of the core design*), apart from the intriguing drawing that recently appeared on the website of Terrestrial Energy. But apparently, the simple solution was sufficiently convincing – LeBlanc filed patents for the design in 2010. Based on the article quoted above, some guesses can be made about the characteristics of IMSR. First of all, it will build on the concept of a special type of DMSR, ORNL’s 30-years-once-through-reactor.It’s lifetime uranium need would be about 1/6 of a conventional LWR. Which may not sound quite as good as the numbers for other proposed molten salt reactors like LFTR, DFR, TAP (formerly known as WHAMSR) or MSFR, but IMSR offers a very significant advantage: the order of magnitude of its realisation are years, not decades. Terrestrial Energy is LeBlanc’s company, its website has an informative, not very loud section on molten salt reactors. The IMSR technology is not yet revealed, but an empty field promises that soon at least some light will be shed on its design. *) On March 15, 2015 this wiki on the IMSR has been updated. This information is consistent with previous posts by LeBlanc and seems accurate.